Updating iPad software is recommended for proper functioning of iPad device. Even after updating iPad software, if you you face issue – you can restore iPad to factory condition. Restore process will delete data and settings on iPad. It will restore iPad in new condition (as it was, when you received it new). 2. Open iTunes program on computer (ideally, it will auto launch). Then select iPad option on left side of iTunes window. 3. Click on Summary tab and then click on ‘restore’ button. Follow on-screen instructions to complete the restore process. It is recommended to backup iPad data using iTunes on your computer. Every time you sync iPad, a backup copy is created on computer. Restore process will delete all data and settings on iPad. 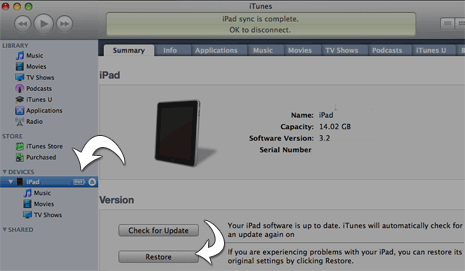 After restore process is complete, you can import back data on your iPad. I just got an ipad and have to install the updates and restore settigns from scratch however, i keep getting 2 things a long time for the download to take place or an 3259 error code. What can i do to resolve these issues please.. This only works if iTunes will recognize your iPAD. After downlaod the new 10.2.x upgrade it crashed my iPAD and now it will not restart or reconnect to iTUNES. This stinks! Everytime I open my Ipad it asks for a passcode even though I have never set one up!!! Still havent been able to use it as I got it for my birthday…Cant even reset it without the mysterious passcode. Anyone know what to do? It might be that your passcode is the same as your iTunes account password. Thanks. But plz explain how I could restore the data back to the ipad.